The Oppo Find 5 comes in cool black box with a highly stylized 5 on top. The box has two flaps on top that are firmly locked in place by a strong magnet. 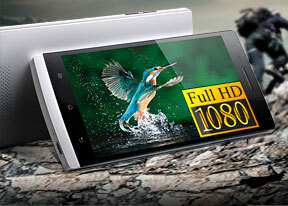 You swing those open to get to the Find 5 and its accessories. What you get in the box is a very compact charger, a microUSB cable to go with it and a single-piece headset. There's also a credit card sized piece of plastic with two NFC stickers on it and a bundle of manuals. The SIM eject pin is styled after the Oppo logo rather than having a generic design like we've seen elsewhere. First impressions are important and the well-designed, well-stuffed box gives the Oppo Find 5 the right sort of premium feel. The Oppo Find 5 measures 141.8 x 68.8 x 8.9 mm, which is about the same height and width as the HTC Butterfly or the Sony Xperia Z, while the thickness is in between. At 165g, the Find 5 has quite some heft to it, but it's not unpleasant - it's evenly spread and gives the phone a solid feel. With that kind of weight the Find 5 is not the easiest smartphone to carry around, but we believe its powerful internals and juicy battery more than make up for it. The Oppo Find 5 has bold angular styling with a few well-placed curves. These make the phone look even slimmer (not that 8.9mm is particularly thick to begin wtih) and improve the in-hand feel. We also like the contrast between the black glass and the matte white body. The handset is designed so that the screen is set within an L-shaped case, and the resulting white chin is a very nice accent. The screen bezels are quite thin at the sides, helping minimize the size of the smartphone. The top bezel is wider to accommodate the earpiece, front-facing camera and sensors, as well as a status indicator that blinks upon missed events, low battery or charging. There's somewhat more bezel at the bottom and that's good because it gives the capacitive keys enough room and the white chin improves things both visually and in terms of getting a secure hold (there's a place for your thumb to rest on). There'll be more on the screen coming up - a display like this deserves a chapter of its own. The straight cut sides of the phone are reinforced by a steel frame that Oppo is quite proud of. Taking 4 hours and 12 different processes to manufacture, it makes the phone extra sturdy, though obviously adding to the weight. The left side features the Power/Lock key and the microSIM card tray. On the right is the volume rocker. The keys are narrow and not very comfortable to press; their sharp edges don't help either. At the bottom of the phone is a microUSB port and the mic pinhole. On top is the 3.5mm audio jack. The back of the Oppo Find 5 is made of a white plastic with soft brushed finish. The 13MP camera and dual-LED flash are within a steel-like plate, with the secondary mic just off to the side. The camera placement isn't ideal: the phone rests right on it and it's very near the top edge, making it easy to cover with a finger while shooting or leave a fingerprint. On the opposite side of the back is the loudspeaker grille and a tiny nub that raises the phone ever so slightly, to give the speaker some room. The back panel cannot be removed, but under it is the 2,500mAh battery. We're running our traditional battery tests and should have the results soon. 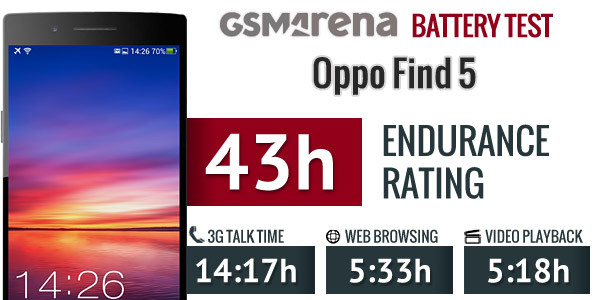 Update: The results are in - the Oppo Find 5 scored an endurance rating of 43 hours. It did pretty well when it comes to talking, but once that big screen comes on, the battery is put under a noticeably bigger strain. The HTC DROID DNA - another phone with 5" 1080p screen and Snapdragon S4 Pro chipset - scored 49h endurance and lasted longer when browsing the web or watching videos. You can learn more about how we do battery tests here. Handling the Oppo Find 5 is a positive experience - our hands have gotten used to big phones with the unrelenting growth of the Androids and the subtly curved back fits well into the palm. The rounded corners are appreciated too, if they were pointier they would have been uncomfortable. The phone feels solidly built too, that steel frame certainly gives it stability. We do have one complaint though - pressing the screen glass at the bottom (where the capacitive keys are) causes it to push against the screen, producing a ripple effect. It's not a big problem, but it does raise some concerns.